Hello there Mood friends! It’s been awhile! Today I’d like to share a project with you that has been my main focus this past Fall. 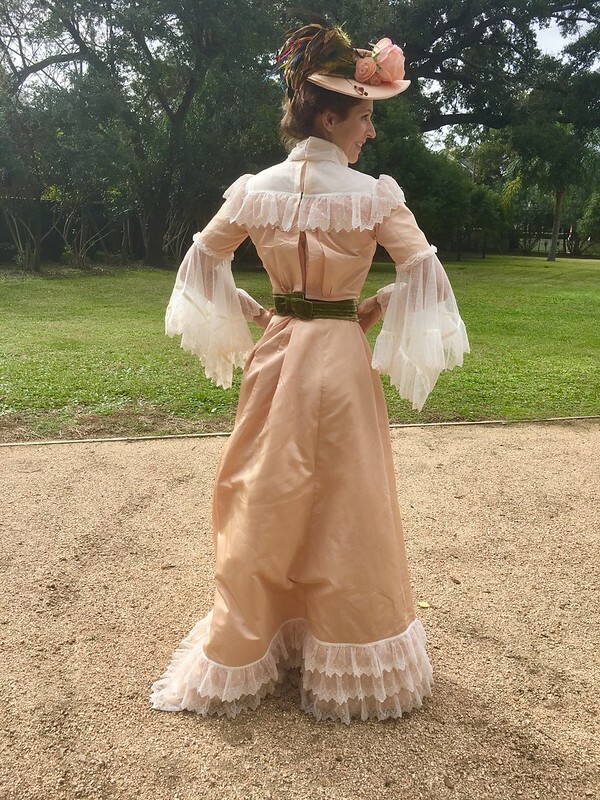 As you can see by the photo, this is something very different for me — historical costuming! 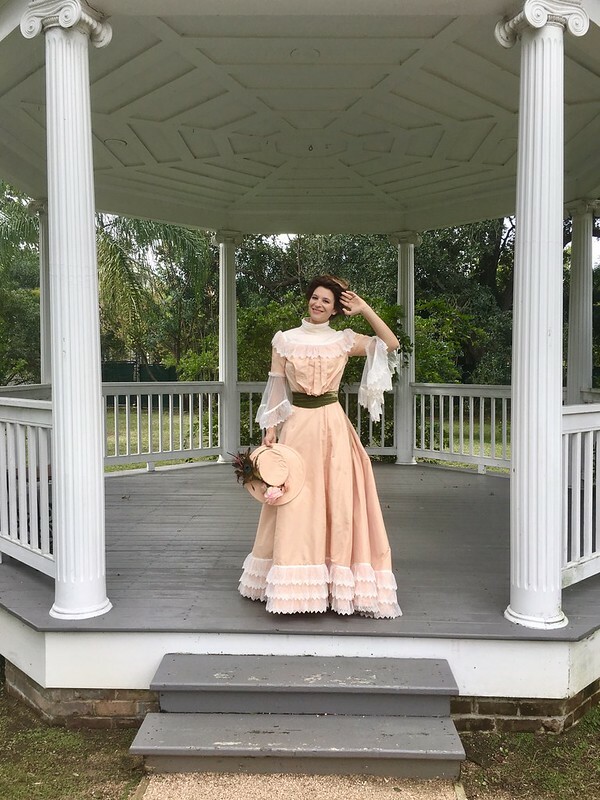 I made this ensemble to attend a Victorian themed event in Galveston, TX called “Dickens on the Strand” which is put on by the Galveston Historical Foundation as a way to celebrate the local historical architecture of the downtown district. For the sake of brevity (and not boring you to tears) I’ll just give the most basic facts today, but if you’d like to read more about this costume I will be writing an exhaustingly in-depth post over on my blog to go up in the next few days. The Victorian period is such a long era — spanning Queen Victoria’s reign from 1837 – 1901 — and features some really unique and iconic fashion movements. 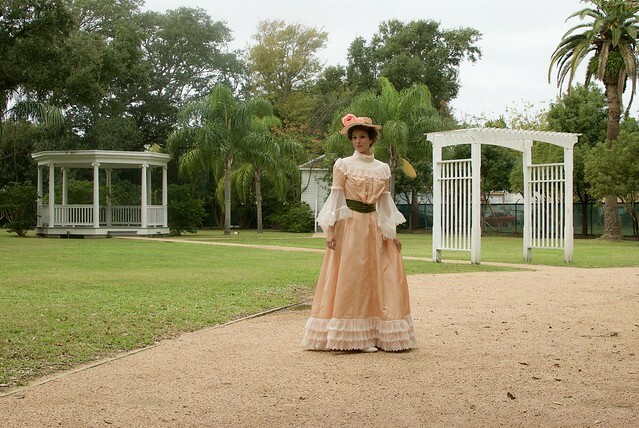 For my historical costume I wanted to pay homage to the Late-Victorian era at the turn-of-the-century. 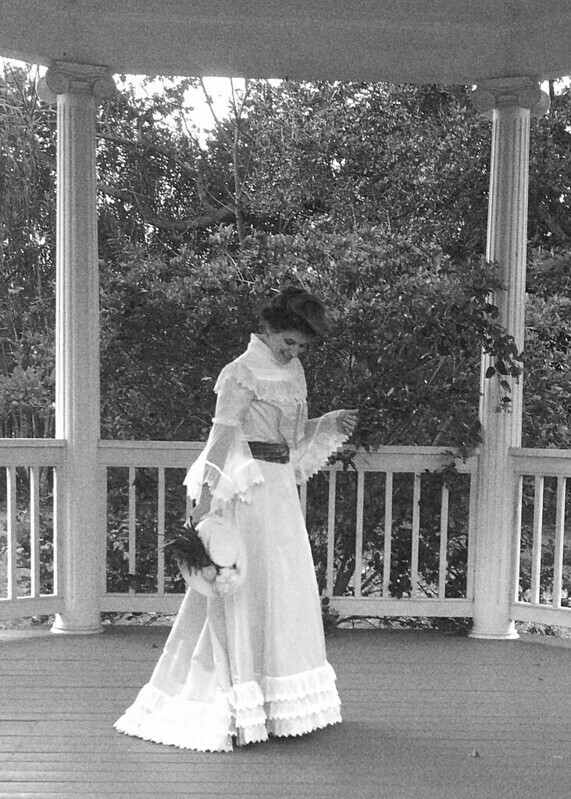 The styles during this time featured wide skirts that were slimmer over the hips with minimal adornment, and much of the focus was on the shoulder and bustline. You also start to see the puffy and drooping bust, known as the “pouter-pigeon” look, that would come to define the later Edwardian period. The wide shoulders, full bust, and flaring skirts all worked together to create the illusion of a tiny waist. Since this was my first time attempting a historical costume, and I was working to a deadline, I wanted to allow myself a bit of hand-holding. So rather than working with a reproduction pattern, or a pattern company I’d never used before, I opted for a modern costume pattern. This is Butterick 5970 — one of their “Making History” patterns. This pattern has modern sizing and construction and the typical Big-4 instructions, which was helpful. Although there was, inexplicably, and inconsistently, the odd instruction to finish seams by “hand overcasting”. Yeah, I laughed at that too! 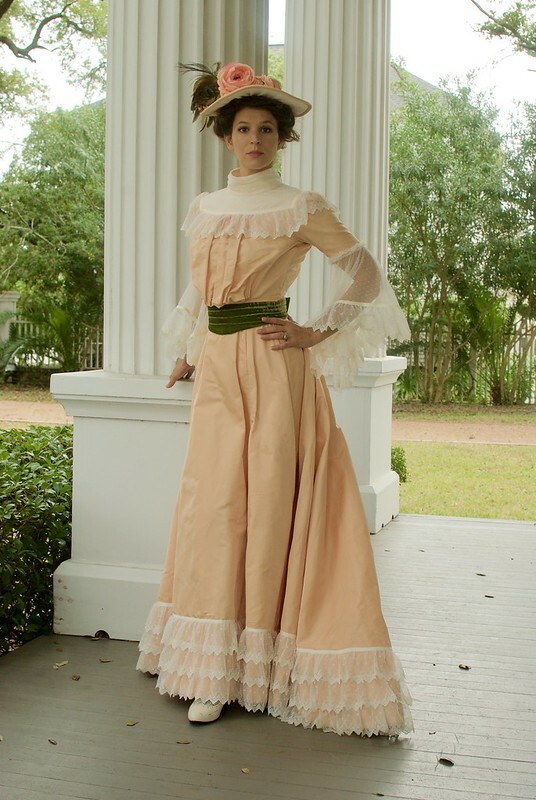 Historical costumes require so. much. fabric!! I was so torn between wanting to be frugal, and also wanting something that felt special for this dress. Thankfully, Mood delivered with this Donna Karan Peach Silk Taffeta which was a great price for such wide yardage of silk. I admit that I initially bought it because it fit the budget, but I was really blown away when it arrived in the mail. 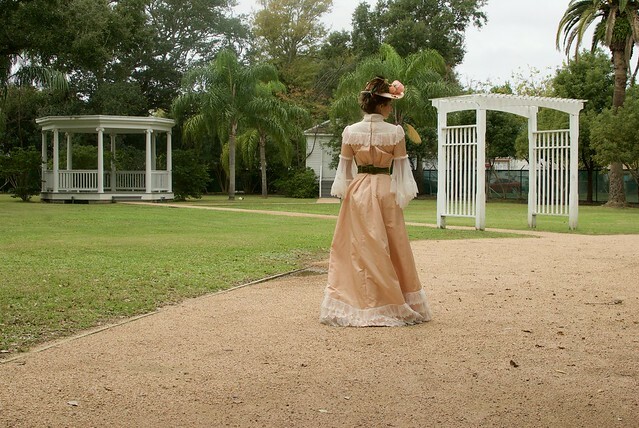 It had a gorgeous, crisp, dry, almost papery hand that I knew would give body to this design without me having to make a bunch of petticoats, and that it would also show off the gathers on the bodice really well. It also has a slight iridescence that made the entire costume look so much richer than I had originally conceived. And the color was just what I had hoped — a warm peachy pink. Not too saccharin, not too orange. The entire skirt is underlined in this Dusty Peach Japanese Pima Cotton Lawn, and the bottom two feet or so is interlined with cotton flannel which I picked up locally. This helps give the skirt more body, and also supports the weight of the lace trim. The pleated belt was made using this Avocado Luxury Lyons Velvet, which is now sold out, but is truly lovely. Honestly, this belt doesn’t do this fabric justice at all! It has a gorgeous drape and is so stinking soft! I interfaced the whole thing with hair canvas to give it some stiffness. This was my first time working with velvet and … it wasn’t pretty! My machine hated it – it kept shifting around underneath my presser feet (no matter which foot I used) and I ended up making this entire belt by hand. It wasn’t too bad, actually, but way more tedious than I was hoping for! Pressing the velvet was, as I expected, a nightmare. I did my best, but I still crushed the pile (frownie face). 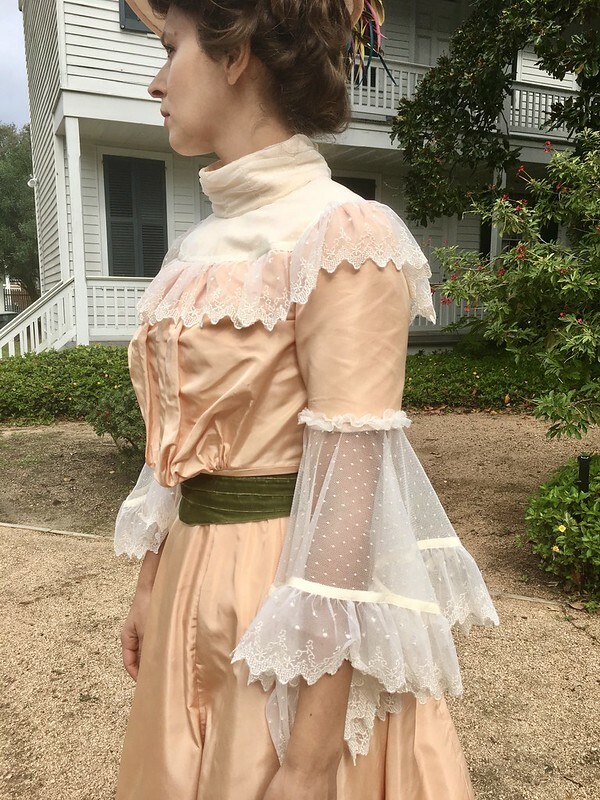 All the accent fabrics for this costume, including the point d’ esprit, petersham ribbon, and yards and yards of netted lace, were picked up locally so I could color match and make sure the hand was correct. I also made my hat entirely by hand! This was the last thing I worked on and I was racing towards the deadline, and honestly feeling really burned out on the entire project. But I’m really pleased with how it turned out! I used this pattern. The base of the hat is a double layer of buckram with wire sewn into all the edges. The base was then covered in cotton flannel, and then covered again in my fashion fabric. 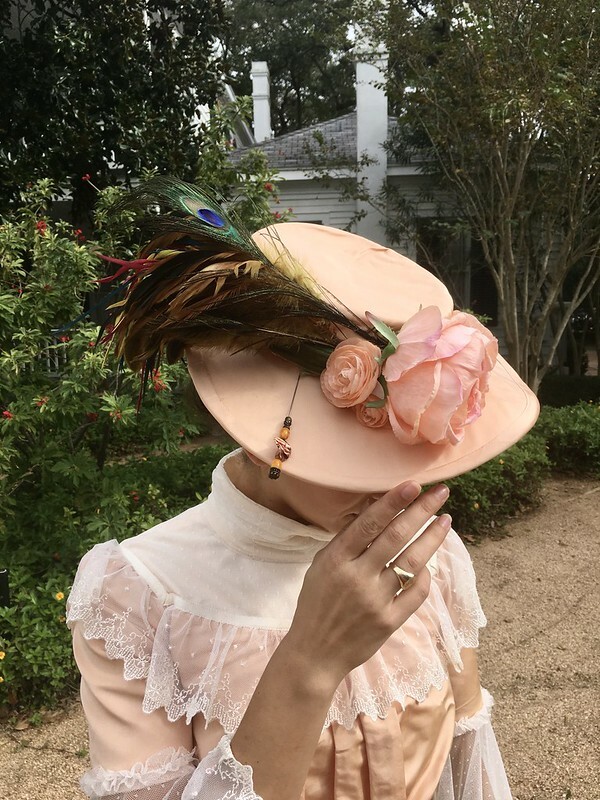 I used the silk taffeta for the outer brim and crown of the hat, and the peach pima cotton lawn with gathered point d’ esprit for the underside of the brim. The hat was decorated (rather haphazardly) with a strip of the avocado velvet, some big, honking fake flowers, and a bunch of feathers to pick up the green accent of the belt. I tacked a comb into the back to hold the hat on my head, and also used a hat pin, which isn’t fully inserted in these pictures because I kept poking myself in the head! The entire gown was fitted to be worn over my period underwear and corset, which you can read more about here, if you’re interested. What’s the most impractical garment you’ve ever sewn? 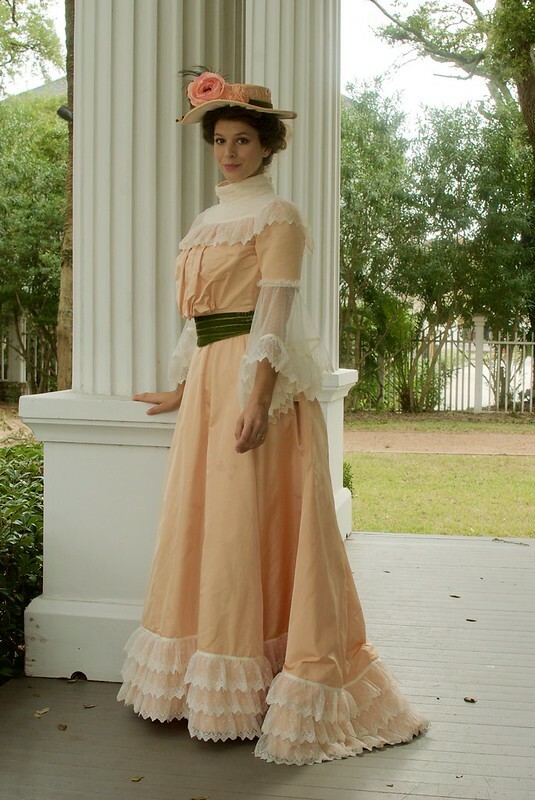 Have you ever dipped your toe into the historical costume world?